From M1, north or south, Exit Junction 33 take the A630 dual carriageway Sheffield Parkway to centre (approx 4 miles) At the bottom take 3rd exit on the A61, past the train station on your left. Continue to next roundabout take 1st exit. Continue along Shoreham Street and bear right (before McDonalds onto St Mary’s Road stay in left hand lane). Continue straight over the next roundabout. At the next roundabout (Waitrose on the left) turn left – Ecclesall Road A625. At roundabout (1mile) turn right on to B6069 Brocco Bank. Take 6th road on left (1/4 mile opposite entrance to botanical Gardens) on to Endcliffe Vale Road. Follow to the top (1/2 mile) turn right on to Fulwood road, and then 200 yards take 1st left on to Shore Lane. The hall is 100 yards up on the left. 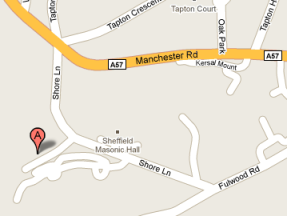 Tapton Hall is about a 10 minute taxi ride away from Sheffield Midland Station. There are plenty of spaces in the Hall Car Park.